Trying to understand why a once engaged customer breaks up with you is often clouded with bad information, not enough data, misguided assumptions, and ultimately, unmet expectations. Much like analyzing any kind of relationship -- romantic or otherwise -- it’s extremely difficult to identify just when the initial breakdown occurred. Typically the reasons are complex and convergent: meaning, not black and white but, usually, a result of compounding issues over time. As centralizing customer experience becomes a core business tenet, and delivering superior customer service remains an important conversion and retention tactic for companies at any stage, we are best served to understand the four main types of customers, the origins of which can be attributed to Albert O. Hirschman -- exit, voice, loyal and neglect. Imagine the competitive advantage of listening -- really listening -- to your customers. It may seem simple, but it’s a tried and true tactic for averting churn. Additionally, these voice customers are brand champions in the making. Some of these customers will stay, but they expect things to get worse. They begin seeking alternatives and evolve into future exit customers. Why? Because for whatever reason, their customer experience has been that of a transaction, rather than a relationship. Without a deep sense of belonging or a relationship with the brand, they have no loyalty or voice, and thus are always on the verge of -- on a whim -- taking a hike. 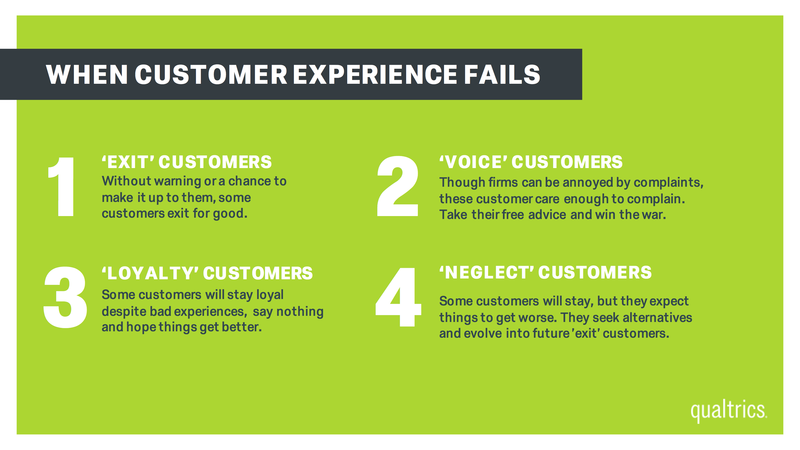 How do you identify neglect customers? Well, first and foremost, take a good look at your organization's process around customer touch points. How much attention are you giving your customers on a regular basis and what is the nature of that attention? If it’s just a standard email coming from your CRM system, you may want to rethink things.